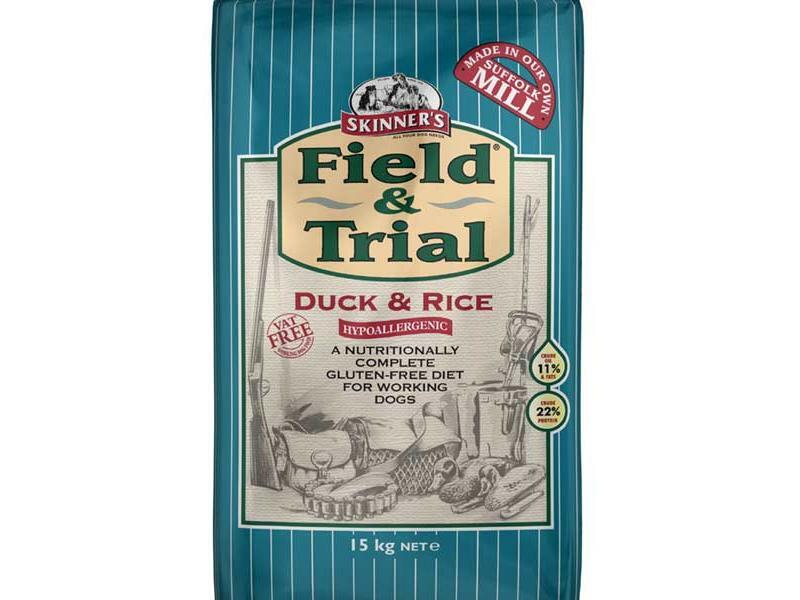 Skinner's Field & Trial Duck & Rice is a specially formulated hypoallergenic diet for working dogs with allergies or digestive sensitivities. The food contains carefully selected ingredients to minimise the risk of exacerbating these sensitivities, including whole rice, duck meat meal and naked oats for an easily digestible, slow-release energy diet. Free from all ingredients known to cause allergies or aggravate stomach complaints, including wheat, maize and barley gluten, dairy and soya products. Added glucosamine and chondroitin will help support joints to aid in your dog's agility and mobility for maintaining an active lifestyle. Whole rice (40%), duck meat meal (20%), naked oats, peas, whole linseed, sunflower oil, beet pulp, vitamins and minerals. Vitamin A 13,000 iu, Vitamin D3 2,000 iu, Vitamin E (as alpha-tocopherol acetate) 310 iu. Iron (as ferrous sulphate monohydrate) 40mg, Iodine (as calcium iodate anhydrous) 1.5mg, Copper (as cupric sulphate pentahydrate) 5mg, Manganese (as manganous oxide) 25mg, Zinc (as zinc oxide) 100mg (as zinc chelate of amino acids hydrate) 30mg, Selenium (as sodium selenite) 0.15mg. Contains tocopherol rich extracts of natural origin (Vitamin E) as EC permitted antioxidant. Below are some recent questions we've received regarding Skinner's Field & Trial Duck & Rice Dog Food, including answers from our team. I have a 11 month old pet Labrador who is allergic to chicken & dust mites so have been advised to feed him a hypoallergenic food. He is currently fed skinners hypoallergenic duck & rice, but I have been advised he needs to loose a little weight & is very hyper. The advise given is it is probably because he is fed working dog food. What food would you suggest I feed him? The concept of a diet for working dogs is more a marketing choice than a nutritional difference between different foods. I doubt if he would be any different on an alternative diet, but the only way to know is to try something else. Working dog diets tend to be very economical to buy, so changing to a different, hypoallergenic diet might well be more expensive. A possible example would be James Wellbeloved Duck and Rice, which is based on the same main ingredients. Is this food suitable for non working dogs? This diet is appropriate for non-working dogs too. Your dog might become overweight if you feed too much, but this tends to happen with all diets of course.